Mustang vs. Camaro. One of the great and continuously ongoing matchups in automotive history. And like their heydays of the late 60s and early 70s, GM and Ford are building their esteemed pony cars better than ever. More to the point, we've been clamoring for the Camaro convertible to debut, but was delayed because of GM's post-bankruptcy reorganization. Ford's major mid-life refresh of the Mustang has proven to be one of the best makeovers they have ever done to one of their cars. The Mustang looks and drives better than before and is now offered with a pair of state-of-the-art new engines. And while buyers for both could choose from either a V6 or V8 coupe, we've haven't had a proper V8 convertible matchup until now. To be fair, I'll be taking the much-despised Swiss neutrality position to, you know, insure the best car is deemed the winner. Loyalty need not apply. To complete the conversion from coupe to convertible, Chevrolet engineers had to handle a number of structural adjustments that included a new transmission brace and two new V-braces. The result looks fantastic. Equally wonderful is the LS3 6.2-liter V8 that makes 426 hp and 408 lb-ft of torque when mated to the six-speed manual (power is down by 23 hp with the optional six-speed automatic). 0 to 60 mph happens in a blistering 4.7 seconds. And although the Camaro's lines may be a bit prettier than the Mustang's (again, depends on whom you ask),the interior is where points are lost. First off, who at GM approved this elephant bathtub sized steering wheel? Seriously, the thing is huge and not only does it look ridiculous, it also makes you feel like a granny behind the wheel. Sound too harsh? Nah. (New) GM should have known better. The Camaro also handles like a large car and for good reason. Based on the rear-wheel drive Zeta platform that's shared with the now defunct Pontiac G8 (the Holden Commodore and Vauxhall VXR8 live on), the Camaro is wider and heavier than the Mustang. GM did the best they could to reduce body roll and other large car traits, but at the end of the day, the Camaro doesn't have the handling agility of the Mustang. As stated before, the Mustang received a fantastic refresh for 2009. It looks amazing inside and out and one must see it in person to appreciate the exterior lines and retro-ish interior. It's powered by Ford's all-new for 2010 (ah...just savor it for a moment) 5.0-liter V8 with 412 hp and 390 lb-ft of torque. While its overall power output may be lower than the Camaro's, the sprint from 0 to 60 mph is even faster at 4.5 seconds. This is due to the significant curb weight difference: 3,725 lbs vs. 4,138 lbs. When it comes to writing that check to the dealership, the damage isn't that painful. 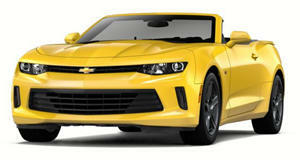 The Mustang GT convertible starts at $38,695 and the Camaro SS convertible at $37,500 - an overall financial tossup. 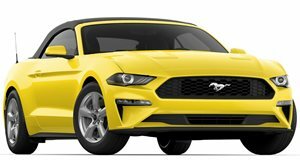 However, facts are facts and numbers show the Mustang GT Convertible to be the better car because it's lighter, handles better, and has a nearly equal base price to that of the Camaro SS Convertible. It's the better reincarnation of the pony car for the 21st century. Still, it's cause for celebration simply because we have the luxury to choose between two great convertibles that are completely worthy of their namesakes and V8s. There's no way to convince devout followers of either car that theirs' is more or less better, as it's crystal clear to Mustang fans that their car is superior and no less obvious the other way around. Any attempt to convince brand-devoted pony car extremists that the arch rival is superior is just futile.